Transforms and dispels phlegm, diffuse lung Qi, benefits Qi, regulates and harmonizes ying and wei, relieves cough, calm asthma. 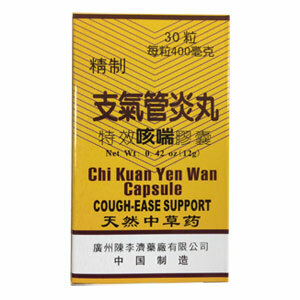 Cough Ease Support is a natural herbal supplement that helps maintain healthy bronchial functions. This is a good formula for chronic accumulation of loose phlegm damp especially in those who are weak or depleted. It can be used for bronchitis following the common cold, and is also applicable in asthma and emphysema. Cough Ease support gives you additional support when you are in chronic or seasonal discomfort, and helps to restore your breathing to normal. Be the first to review “Cough Ease Support” Click here to cancel reply.